TAKE A PEEK IN MY STORE. 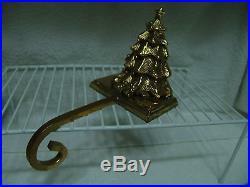 HERE IS A BEAUTIFUL VINTAGE BRASS 3D CHRISTMAS TREE STOCKING HOLDER/HANGER. IT IS VERY CUTE WITH GIFTS IN FRONT OF IT. IT SHOWS A TINY BIT OF WARE, JUST A COUPLE OF SCUFFS / SCRATCHES. 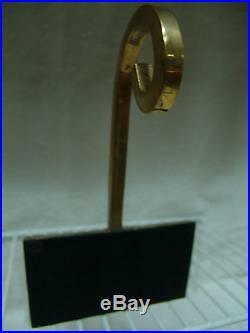 IT IS ABOUT 5 1/2 INCHES TALL, X 8 INCHES DEEP, 5 INCHES WIDE. ALL MY ITEMS COME FROM ESTATE SALES AND AUCTIONS. I DO NOT KNOW WHAT TYPE OF HOME THEY COME FROM. Please look at the picture I have provided for details. 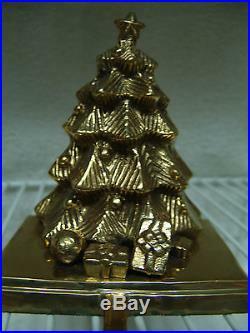 The item "VINTAGE LARGE 3 D BRASS CHRISTMAS TREE STOCKING HOLDER" is in sale since Wednesday, March 4, 2015. 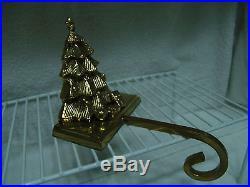 This item is in the category "Home & Garden\Holiday & Seasonal Décor\Christmas & Winter\Stockings & Hangers". The seller is "hwcopleylady" and is located in Akron, Ohio. This item can be shipped to United States, Canada, United Kingdom, Denmark, Romania, Slovakia, Bulgaria, Czech republic, Finland, Hungary, Latvia, Lithuania, Malta, Estonia, Australia, Greece, Portugal, Cyprus, Slovenia, Japan, China, Sweden, South Korea, Indonesia, Taiwan, Thailand, Belgium, France, Hong Kong, Ireland, Netherlands, Poland, Spain, Italy, Germany, Austria, Israel, Mexico, New Zealand, Philippines, Singapore, Switzerland, Norway, Saudi arabia, Ukraine, United arab emirates, Qatar, Kuwait, Bahrain, Croatia, Malaysia, Chile, Colombia, Costa rica, Dominican republic, Panama, Trinidad and tobago, Guatemala, El salvador, Honduras, Jamaica, Antigua and barbuda, Aruba, Belize, Dominica, Grenada, Saint kitts and nevis, Saint lucia, Montserrat, Turks and caicos islands, Barbados, Bangladesh, Bermuda, Brunei darussalam, Bolivia, Ecuador, Egypt, French guiana, Guernsey, Gibraltar, Guadeloupe, Iceland, Jersey, Jordan, Cambodia, Cayman islands, Liechtenstein, Sri lanka, Luxembourg, Monaco, Macao, Martinique, Maldives, Nicaragua, Oman, Pakistan, Paraguay, Reunion.